March 27, 2017 — Links International Journal of Socialist Renewal / John Riddell's Marxist Essays and Commentary website — One hundred years ago today, on March 27 (14), 1917, the Petrograd Soviet issued the following appeal “To the Peoples of the World,” calling for a restoration of workers’ unity in the cause of peace. The moderate socialists who dominated the Petrograd Soviet until September 1917 pursued a policy of “revolutionary defensism,” which advocated defending Russia and its revolution against German aggression while calling upon European socialists to pressure their governments to bring about peace. This policy toward the war would not be consistently defined until the return from Siberian exile of Tsereteli and other Menshevik leaders on April 2 (March 20), 1917. Therefore, the document below reflects the views in the Soviet at a time when moderate socialists were still open to making concessions to their radical counterparts regarding the Soviet’s position on the war and other issues. Discussions in the Soviet were crucial to the realignment of leftist forces that occurred in the wake of the February Revolution. Selection, translation, and annotation by Barbara Allen. See below for explanation of Russian dates. Comrades, proletarians, and laborers of all countries! We Russian workers and soldiers, united in the Petrograd Soviet of Workers’ and Soldiers’ Deputies, send you our heartfelt greetings while announcing a great event. Our Russian democracy has extinguished the centuries-old tsarist despotism. We now join your family as a member with full rights and as a formidable force in the struggle for our mutual emancipation. Ours is a great victory for world-wide freedom and democracy. The “policeman of Europe” and the chief buttress of world reaction is no more. Indeed, it has been buried never to rise again. Long live freedom! Long live the international solidarity of the proletariat and its struggle for final victory! Our cause has still not fully triumphed. The vestiges of the old order have not yet dispersed. Enemies of the Russian Revolution are gathering their forces against it. Nevertheless, our gains are enormous. 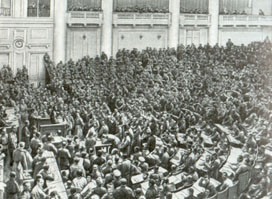 The peoples of Russia will express their will in the Constituent Assembly, which will be convened very soon based on universal, equal, direct, and secret suffrage. Already, we can predict with confidence that a democratic republic will triumph in Russia. The Russian people possess full political freedom. They can now speak authoritatively about the country’s domestic and foreign policy. Appealing to all the peoples who have been ruined and destroyed in this horrific war, we declare that the time has come to struggle resolutely against aggression by governments of all countries. The time has come for all peoples to resolve the question of war and peace. Cognizant of its revolutionary strength, Russian democracy declares that it will oppose by all means the ruling classes’ aggressive policy. It calls upon the peoples of Europe to speak and act out jointly and resolutely to foster peace. We appeal to our brothers, the proletarians of the Austro-German coalition, and above all to the German proletariat. From the very beginning of the war, we were convinced that by taking up arms against Russian autocracy you were defending European culture from Asian despotism. Many of you believed that this justified your support for the war. Now this justification no longer exists. Democratic Russia cannot threaten freedom and civilization. We will firmly defend our own freedom from any kind of reactionary encroachments, whether internal or external. The Russian Revolution will not retreat from the bayonets of the conquerors and will not be crushed by foreign military force. We call upon you to throw off the yoke of your semi-autocratic order just as the Russian people shook off tsarist despotism. You should refuse to serve as a weapon of invasion and violence in the hands of kings, gentry landowners, and bankers. Together in friendship we will put a stop to the terrible slaughter, which disgraces humankind and casts a shadow over the great days of the birth of Russian freedom. Working people of all countries! Across mountains of our brothers’ corpses, across rivers of innocent blood and tears, across smoking ruins of towns and villages, and across lost cultural treasures, we extend to you a fraternal hand and summon you to a renewed and strengthened international unity. This will secure our future victories and the full emancipation of humanity. First published in Izvestiia, no. 15, March 28 (15), 1917. Reprinted in A.G. Shlyapnikov, Semnadtsatyi god, volume 2, 1925, p. 291. On Shlyapnikov’s role in the 1917 events, see Barbara C. Allen, Alexander Shlyapnikov 1885-1937: Life of an Old Bolshevik, Chicago: Haymarket Books 2016. Rex A. Wade, The Russian Revolution, 1917, Cambridge, 2000, pp. 67-70. The Julian calendar used by Russia in 1917 ran 13 days behind the Gregorian calendar that is in general use today. In the “View from the Streets” series, centennial dates are reckoned by the Gregorian calendar; dates are given with the Gregorian (“New Style”) date first, followed by the Julian date in parentheses.